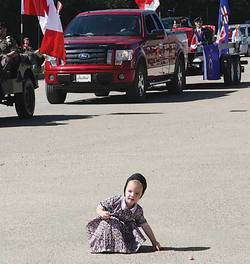 As the parade passes, a lovely little girl from Warburg Colony scrambles for some sweet treats at the 2013 Warburg Canada Day Parade. From antique cars buffed to perfection to a petting zoo, the 2013 Warburg Canada Day celebrations of June 22nd and 23rd offered many exciting activites. Older folks drew up their lawn chairs in front of the stage for some great toe-tappin’ country and gospel tunes performed by Joshua Ridge, Crestamere Cowboys, and Gospel 792. Many supported local groups by purchasing a burger or hot dog fresh-off-the-grill from the 2014 Grads or a slice of those delectable homemade pies from the Warburg Museum. Leduc County FCSS Parent and Family Coach, Carol Langner, with the Leduc Regional Parent Link offered a bean bag toss game—popular with toddlers. Kids snagged free prizes in the fishing pond and ordered cotton candy at the Warburg Ag Society/FCSS table. Adults entered the 50/50 draw and the Chicken Poop contest to support the Canada Day fund. Among the featured vendors were Kelsey’s Jewelry and Fashion, Candice’s Passion Parties, Crochet Designs by Bea Hardowa and others, handcrafted wooden windmills, Jean Gomuwka’s famous antipasto, and Beatrice Gruninger’s Epicure selections. Along the park’s south fence, lovely paintings were hanging on display—a sampling of what you could be doing. Warburg painters meet every Wednesday from 10 to 2 at the Seniors’ Centre. If you think you have an inner painter clamoring for expression, but don’t want to risk the investment, just bring an art board to paint on. Jean and her friends will loan you brushes and paint—enough to recognize if you really would like to pursue painting. Bring a lunch. Expect laughter. Kids enjoyed bouncing for free in two inflatable castles sponsored by Leduc County and Capital Power. Lee A. Simants, a Public Consultation Advisor with Capital Power, said, “It is important for us to be a part of the community and to gather to celebrate our Country’s Birthday.” Besides giving away 500 delectable red and white topped cupcakes (made by Nancy Gruninger), Capital Power brought in three expert face painters—which explains the many happy Spidermen, Hulks and fairy princesses, along with two-legged cats and dogs running around the park. Nicole Sagen, Amanda Wemp, and Brooke Kuzio with Leduc County Parks and Rec applied temporary sparkle tattoos. MayO, a member of the Edmonton Caring Clown Society, has been clowning for seven years. His specialty is fashioning delightful 2-balloon creations—from monkeys climbing trees to swords with belt carriers. He does special events but mostly entertains in mandated senior homes. Caring Clowns use humor and gentle play to make meaningful connections with audiences. This helps, in the healing process, to alleviate fear and confusion often associated with illness and living in long-term care facilities. Caring Clowns also compete at the World Clown Association. The old fashioned bathtub race has made a comeback. There were four entries: 1st place finish—Jennifer Pryztula’s Team, 2nd place—Buck Mountain Gas Co-op, 3rd place—Mustache Rides, and 4th place—Szepesi Clan. Three Show N Shine cars were featured this year including Norm Grabatin’s beautiful 1930 Hudson. A restoration 30 years in the making, it includes 100% original items—including the mohair interior taken from a 1930s bolt. Yes, it has an ah-oo-gah horn—the last year a Hudson offered one. Blooming Buddies served delectable beef-on-a-bun and chocolate and strawberry sundaes in the Warburg Cultural Centre. One vendor was different from all others – featuring a display of a tragic event, the death of 4-and-a-half-month old Delonna Sullivan while under the care of Child and Family Services of Leduc, Alberta. It is beyond the scope of this article to delve deeper into this heartbreaking story. Suffice it to say that Jamie Sullivan (Delonna’s mother) and Jamie’s mother Marilyn Koren hope to spark awareness of both parental rights and children’s rights when an infant or child is placed in foster care. By 3:00 PM, the park was vacated as people headed to the Metal Mayhem eventWarburg’s 8th Annual Demo Derby held north of town. The day came to a fitting end with a fireworks display at 11:30. The parade was moved to Sunday this year. Parade entrants began assembling soon after the delicious pancake breakfast that was served by the Warburg Village Council and Staff. Unfortunately, the Warburg and District Fire Department received a call out just before the parade began. Leslie Nemeth served as Parade Marshal. This year’s three parade judges were Diana Bachand, Kevin Maine, and Donna Tomaszeski. ANTIQUES: 1st Carl Maciborski—1928 Model A Ford Coupe, 2nd Reuben Schmidt—1901 Oldsmobile (Mr. Schmidt has announced this will be the last year he will be driving in the parade. He is 92! ), 3rd Paul Spurrell—Legion Military Quad. OUT OF TOWN BUSINESSES: 1st J&G Greenhouse, 2nd Leduc County. BICYCLES: 1st Ella Kohl, 2nd Amy Drysdale, 3rd Marissa Clarke and Honorable Mention to the rest of the Girl Guides’ Bike Brigade. LOCAL BUSINESSES: 2nd Buck Mountain Gas Co-op. ANIMALS & HORSES: 1st Martin Farm Equipment, 2nd Gord Schnick. SPORTS CLUBS: 1st Golden Phoenix Taekwondo, 2nd Warburg Figure Skating Club, 3rd Warburg Curling Club. SOCIETIES & ORGANIZATIONS: 1st Warburg Seniors, 2nd Warburg Museum, 3rd United Church. The Royal Canadian Legion hosted a beer garden at the Legion Hall. All donations for the hot dogs went to the Red Cross. Kids enjoyed a petting zoo and pony rides in the Arena parking lot. Shirley Ennis, Alberta Farm Safety Centre’s West Central Instructor, set up a walkabout in the curling rink to highlight safety hazards. “We want to encourage everybody on the farm and in urban areas to do a walkabout at their own place to identify risk and hazard areas,” she said. Eight interactive displays dramatically illustrated potential risks and hazards involving helmets, ATVs, machinery, entanglement, animals, water, and chemicals. Some experimented with “egg helmets” to test their ability to keep an egg safe, and what happens when improperly fitted helmets or seat belts are used. By far, the most intriguing exhibit was about Grain Drowning. Ennis estimates 170 people visited the display, including a number of recent Warburg School farm safety graduates who volunteered to assist her. She found this especially gratifying having taught the Farm Safety program at Warburg School for four years before retiring. “The whole idea of this program is when these kids become adults, safety will become a part of their normal world.” Truly, that is what we would all like to see—a safer, happier Canada for ourselves, our kids and future generations. Happy Canada Day.